For hundreds of years, canaries have been a favorite pet!... renowned for their beautiful song, coloration, and feathering since 1478 when the Spaniards conquered the Canary Islands! These little birds are ideal for small living quarters and do very well in captivity. Though primarily a cage bird, they make excellent pets for beginners and do not harm children. They are very hardy, docile, and have low care requirements. They are also fairly easy to breed. 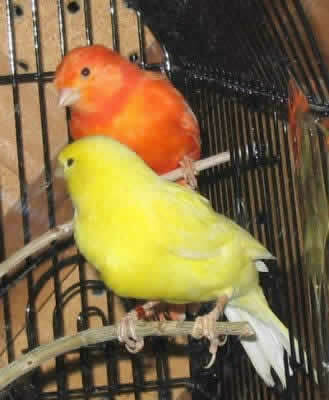 Some people prefer a male canary as all males kept as a single bird can sing, even if they were bred for other characteristics. Some females will also sing, though their song is not as strong as the male. The Roller canary is considered the best singer. Many people like to show canaries. They come in a wide variety of colors from yellows to whites, blue and white mixes, and deep oranges to light reds. The redder the canary the more valuable it is, with the Red-Factor being the most valuable.